There is nothing new left to be said about Port Ellen, the Islay distillery which closed in 1983 but remains perhaps the most iconic of all the Scottish distilleries (among whisky geeks, that is; the vast majority of the Scotch drinking world has never heard of it); not even that its reputation may be somewhat overblown. This last part is hard for me to confirm as I’ve had relatively few Port Ellens (less than 20 and the vast majority of those via small’ish samples from very generous friends). The best ones have been outstanding, but then the best whiskies from most great distilleries are outstanding. It may be more impressive that I’ve never had a bad one, but it is also true that due to the vagaries of the business all Port Ellen available now is >20 years old (and these days >30 years old). In its days of operation it was a high output distillery, most of whose product went into blends, and it wasn’t until the late 1980s (well after it closed) that it began to be available as single malt. Who knows, perhaps if all that was available of Glenfiddich was a small selection of its output between 20 and 35 years of age, more whisky geeks would rhapsodize about Glenfiddich too. The truth is it is not easy to separate romance from palpable sensation in a hobby such as ours, and there’s a point at which even if you can’t taste the romance it is certainly part of the experience, and perhaps for that reason not false. Be that as it may, the romance of the great lost distillery has certainly made Port Ellen a very lucrative proposition for those bottlers who hold casks: while it is still possible to find some indie Port Ellen in the mid-$200s, most is now past the $400 barrier, and Diageo’s official annual releases now start out north of $500 and climb very steeply from there in the secondary market (only Brora among other closed distilleries can really compare, and there’s far less Brora out there). Scott’s Selection, who released the bottle I am reviewing tonight, must be kicking themselves for releasing a bunch of casks of Port Ellen in their early 20s in the early 2000s. If they’d held onto them they could have got thrice the price now. Me, I don’t own very many Port Ellens but to guard against the temptation to flip them for a lot of money I opened them all as soon as I got them. Nose: Sweet peat at first that sharpens almost immediately with a briny character coming to the fore–more salt than kelp. Whiffs of diesel too and also lemon peel/oil. The sweet peat is still perceptible though, behind the sharper notes. With more time the sweetness expands again and now there’s something organic as well. A few drops of water wake the salt crystals back up but the lemon is fermented/preserved now. Palate: Seems at first that it’s going to be sweet but sharp smoke puts an end to that, bringing salt and acidity with it. Sharp as a chisel with a stony, minerally quality to ground it. More medicinal with time and the sharpness/acidity rounds out as well. Water brings the lemon out on the palate as well but it’s sweeter here and quite infused with peat. Really quite sweet now with water. Finish: Long, smoky, acidic. The sweet peat emerges again late in the finish, a little muskier now. Much sweeter with water on the finish as well. Comments: At first this seemed like it was going to be a very simple, if pleasurable whisky, with sharp, acidic peat as the predominant characteristic on both the nose and palate. But with time and water there’s quite a lot of development till finally the predominant note is a musky sweetness. This pulls it up to the high 80s ratings-wise but this is still a little too narrow a palette to climb into the 90s for me. 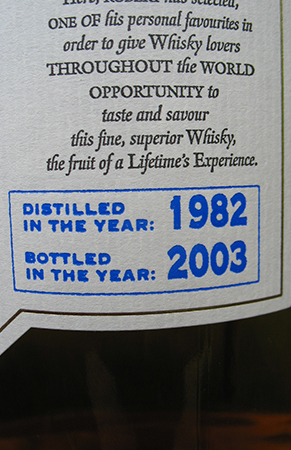 Very nice though, and probably more evidence for those who hold to the “Port Ellen is still made today; it’s just called Caol Ila now” line. 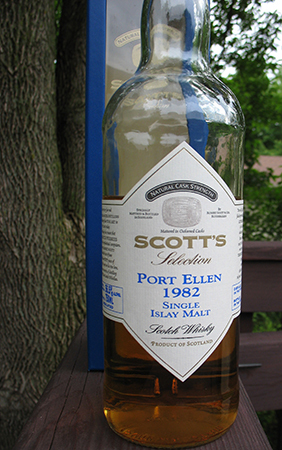 This entry was posted in -Whisky by Rating, 85-89 points, Port Ellen, Scott's Selection, Whisky by Bottler. Bookmark the permalink.